I can only guess why Nate texted me this cell phone photo of a cereal box. It could very well be the old couple, straining to grin like an interracial version of the old people hobgoblins from Mulholland Drive. Or it could be that the cereal itself is advertised as being a "trio of flakes, twigs and granola." (Seriously? Flakes? And twigs? Two things that generally bring unappetizing connotations to mind and therefore have no place in food?) 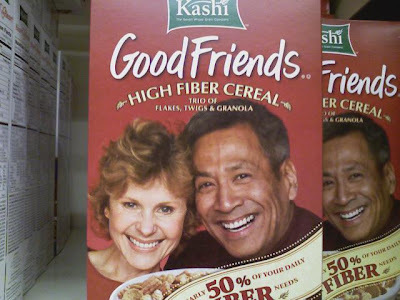 Or, finally, it could be that Nate remembered the name of this blog wrong and assumed I'd be interested in the fronts of cereal boxes. Whichever one it is, those old people are not anything I want to see first thing in the morning. augh!!! your mean and hate old people!!! bad man!!! Maybe I'm on the path to being old, but I'll do whatever I can to avoid being on the path to being old and creepily mugging on a cereal box. Ah, but someday you might not resist the lure of all the free high fiber cereal you can eat as pay.